With all the country style charm you are looking for, the Amish Royal Arrow Bench is handcrafted to please! This gorgeous solid wood bench is warm and inviting and makes a friendly addition to your foyer, entryway or hallway display. 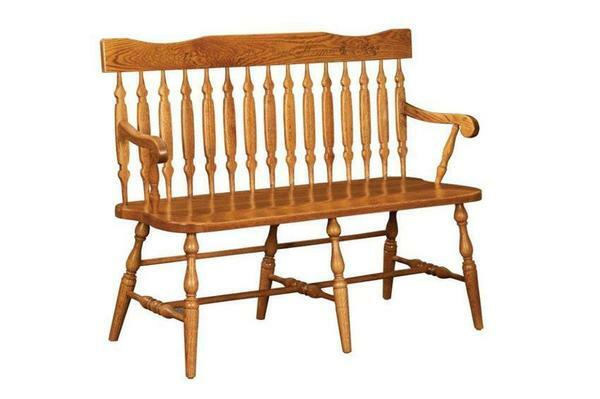 This country style bench looks both elegant and relaxing with its curving arms, decorative legs and paddle shaped slats. Create a warm ambiance with this custom made country bench. Provide the perfect place to sit and change shoes in your entryway, or create the hallway decor you've been dreaming of in your country home. The Royal Arrow is a great place to gather family or siblings for a cherished photo as well. View more of our solid wood benches as well as our country furniture designs for other areas of your home.